Sherlock Gnomes (film, 2018). A 2018 3D computer-animated fantasy romantic mystery comedy film with "PG" rating by Paramount Pictures. Directed by John Stevenson. Official Trailer. Sherlock Gnomes is a 2018 3D computer-animated fantasy romantic mystery comedy film directed by John Stevenson. 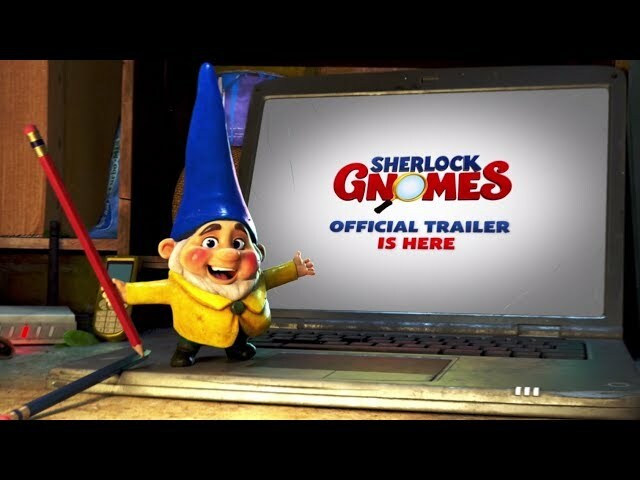 Sherlock Gnomes | Official Trailer | Paramount Pictures UK. Sherlock Gnomes and his assistant, Gnome Watson, storm into London's natural history museum, where their nemesis, a pie mascot named Moriarty, is holding gnomes hostage, planning to smash them. After a brief battle, Moriarty is defeated by getting seemingly crushed by a dinosaur skeleton. Meanwhile, Gnomeo and Juliet, as well as the other gnomes, are moving to London. While there, Gnomeo and Juliet are declared the new leaders of the garden. Noticing that Juliet has cast him aside to improve the garden, Gnomeo leaves to find a flower as a centerpiece, but nearly gets caught in a shop, forcing Juliet to rescue him. Gnomeo and Juliet return to the garden, but then find out that all the other gnomes have gone missing. Sherlock and Watson show up at the scene to investigate, and after Gnomeo and Juliet help them escape from a sewer flood, Sherlock agrees for them to team up. Sherlock inspects a clue supposedly given to them by Moriarty, who he believes survived their last encounter, and concludes that the clue is leading them to Chinatown. They find the next clue at Curly Fu's Emporium, and escape a group of Maneki-nekos whom Sherlock had previously offended. They arrive back at the natural history museum, and Gnomeo suggest that they look inside for the answer to the clue, but Sherlock decides to ponder at an art gallery instead, and Juliet follows him. Outraged that Juliet doesn't trust him, Gnomeo goes into the museum anyway, with Watson in pursuit, only for a Gargoyle to kidnap Gnomeo, while seemingly smashing Watson. Gnomeo is brought in with the rest of the gnomes, and informs them that they are to be smashed the following evening during a fireworks celebration. Meanwhile, Sherlock figures out that the next clue is at the royal park. He and Juliet disguise themselves as a squirrel to get the clue from a dog, and succeed by evading the dog on a lawn tractor. 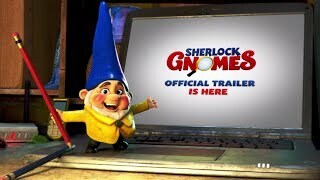 The film Sherlock Gnomes was scheduled to be released by Paramount Pictures on March 23, 2018 (United States), on April 11, 2018 (France), on May 3, 2018 (Germany, Denmark) and on May 11, 2018 (United Kingdom, Ireland). The duration of the film is 86 minutes. With a budget of $59 million, the film grossed over $90.3 million. Sherlock Gnomes got low rating from critics. The audience dislikes the film either. Audiences polled by CinemaScore gave the film an average grade of "B+" on a scale ranging from A+ to F.